On May 10, 2003, 150 friends, colleagues, and activists gathered to honor Mary Lee and her more than 30 years of contributions to Champaign-Urbana and Illinois. Below are some of the stories shared that night. Paul Apodaca took a history course from Mary Lee in the "Honors Integrated Studies Program." His remarks originally appeared in The Parkland Prospectus newspaper in 2001. Mardy Karen Keener is a retired Professor of English at Parkland College. Her remarks were originally presented in March 2003 at a tribute to Mary Lee held at Parkland College. 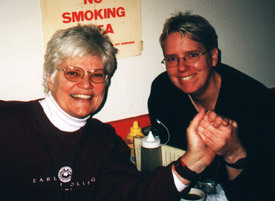 Meg Miner, a member of the 85% Coalition, was arrested with Mary Lee along with three others in May 2001 during a civil disobedience in the Illinois State Capitol to protest the stalling of a gay rights bill.